This flavorful black bean soup is made in the Instant Pot and is ready in less than 30 minutes. It’s gluten-free, dairy-free, and this recipe has an option to make it Vegan. One of the easiest things to make in the Instant Pot is soup. Especially when it’s as simple as dumping the ingredients in the pot and pressing start. This soup is ready in less than 30 minutes, and it can be frozen ahead of time. It makes for a quick and easy dump and start! Simply add all of your ingredients into the bag except for the chicken broth (Veg. broth for Vegan option) and stick it in the freezer. There’s no need to defrost the bag before cooking, Just dump the frozen ingredients into the Instant Pot, pour in the broth and you’re good to go. No need to adjust the cook time! This soup can certainly be served as a complete meal, but it pairs deliciously with tacos! I like to pair this soup with a dish that packs some heat such as these Instant Pot Beef Barbacoa Tacos. The dishes together have great balances of flavors! My Pork Carnitas Tacos also pairs great with this black bean soup! 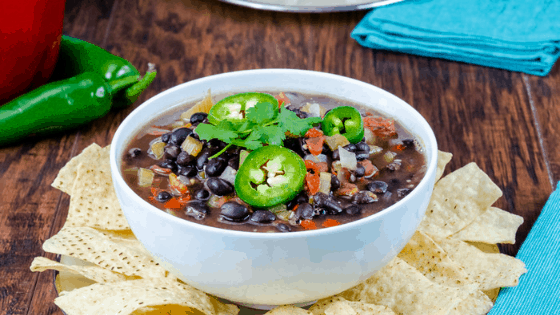 I serve this black bean soup with tortilla chips because it’s a great soup for dipping! Or, you can scoop it up by the spoonfuls – or both! This black bean soup is naturally gluten and dairy-free! It’s perfect for when guests are coming over with a special diet! It can also be made Vegan by using a vegetable broth of your choice. This soup is also packed full of flavor so it’s one that you or your guests with special diets will enjoy! This flavorful black bean soup is made in the Instant Pot and ready in less than 30 minutes. It's gluten-free, dairy-free, and this recipe has a Vegan alternative. Add the celery, onion, diced red pepper, diced jalapenos, and garlic to the Instant Pot. Pour in the black beans, tomatoes with green chilies, cumin, pepper, and lime juice. Pour in your broth of choice and top with bay leaf. Do not stir. Close the lid and set to MANUAL/PRESSURE COOK for 6 minutes. Allow the Instant Pot to Naturally release for 10 minutes before removing the lid, remove the bay leaf and serve. Add the celery, onion, diced red pepper, and diced jalapenos into a large sauce pan. Add in the Garlic and set on low heat. Allow the veggies to cook for about 3 minutes, add in the black beans, tomatoes with chilies, cumin, pepper, and lime juice. Pour in your choice of broth and bay leaf, stir. Simmer on low for about 25 minutes, stirring occasionally.